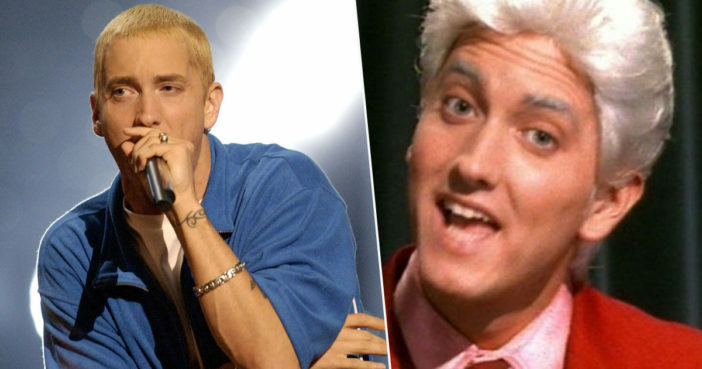 It’s been two decades since The Slim Shady LP launched Eminem into the public conscious, causing the sort of parental hand wringing usually reserved for Marilyn Manson. Eminem’s early tracks drew from murderous fantasies and deep reservoirs of rage, using the sort of crude, offensive language likely to get you sent to bed without dinner. To be fair on him, my dad was oddly a big fan of Em’s venom-filled track Cleanin’ Out My Closet (2002), perhaps cheered by the thought of children threatening to tidy their rooms with such passion. The 46-year-old rapper’s way of weaponizing words has defined him from the very beginning, setting him apart as one of the most controversial figures in popular music. And it seems he has used his lyrics to imprint his identity onto the hearts and minds of rap fans in more ways than we could have anticipated. Take My Name Is, from The Slim Shady LP, a track where Em introduces his twisted alter ego, Slim Shady. Hi, my name is, huh? My name is, what? The deceptively simple chorus is effective in establishing and parodying Slim Shady as the rap bogeyman of the late ’90s, a ghoulish figure to be blamed for horrific acts of violence.